You’d think I could have nipped this little habit in the bud, but of course I failed. She knows who’s in charge. There is little question that I have been away from this space for too long. I want to do something about that. I miss it. Now that my world is about to open up again — yes, I am finished with chemotherapy! — I hope to find myself knitting more, and living life, and writing about it again. I’m still processing what it means to have successfully navigated these past five and a half months. It will be a while before I do, and for now the good old slow and steady approach still serves. I feel cautious about everything — but happy, definitely happy. I did it! If only winter were not so relentless! I want sunshine! I want bright blue skies! Instead, it’s been snowing this morning, and rain is on the way. There’s been ice and snow on the ground forever, and the gray of the sky and the ground and everything in between doesn’t help. I’m tired enough that I slog through each day anyway, and having to add a trudge over leftover snow in colorless light and landscape is just too much, don’t you think? I’m knitting away on little things, but nothing is worth showing yet. I started a Whimsy Lace Scarf just like Rosi’s (because hers is an inspiration) with Hand Maiden Mini Maiden (just like Rosi) in “Paris.” It’s a wonderful pattern with lots of short rows, so it’s fun to knit. I love the yarn, too. There are socks, of course. And I feel some mitts coming on. … just now, I think Annabelle has the right idea! Next Just who am I, anyway? It’s a NEW DAY! Wonderful that you’ve finished with the chemo and are thinking about getting back on with things. Fab! Congrats on finishing your chemo! I think you need some nice bright, summer-colored yarn to knit. Spring will be here soon. I love that photo of Annabelle and the lamp. It's so good to "hear" your voice again. 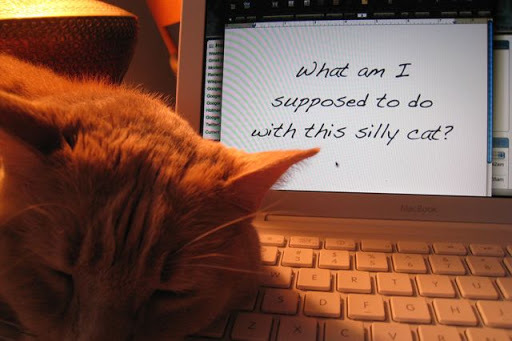 What great kittie pics – I think the first one is a universal "kittie & laptop" pose. 🙂 Hang in there, the gray gives way to vivid colors & more! Welcome back and yipee that it is all over . welcome back! so glad that your 5 1/2 months is over . The grey skies will give you the peace you need while you mend and the blue skies will be there for you when your energy returns. Congrats on being done with chemo!! !How the heck can Annabelle sleep with her chin up like that?! Annabelle looks like she is sunbathing.Remember to post a poem on Feb. 2, yes? According to tradition, poetry warms the heart of the earth, reminds her that spring is right around the corner.CONGRATULATIONS!!! on completing your chemotherapy. You are mighty! Onwards and upwards to your regularly scheduled energy and great good health. BRAVO!! Congratulations on making it through!!! I’m a fellow traveller, and completed my time at camp chemo 1 1/4 years ago!!!! Welcome to the club of survivors! God bless you! So happy for you about the chemotherapy! And congratulations on the blog of note 🙂 I love those pictures of your cat… truly adorable! Jane and Annabelle, I’m glad I came across your blog. Congratulations for being chosen a “Blog of Note”! I enjoyed my visit. A blog of note by a sister of note! Congratulations. As for Annabelle–it’s no surprise. In our family, the pets have always been in charge. Congrats on being the Blog of Note today. Im so happy that I came to visit your site and I for sure am going to make many trips back. Im glad that your chemo is done. And though the snowy days might not seem as bright as the sunny ones find beauty in them anyway!!! By the way the pics of Annabelle are way cute!!! Pets can bring so much joy into our lives! I found you through blogs of note. Well done for making it- both as a blog of note and the chemotherapy. Lovely pictures of ‘silly cat’.Enjoy the knitting! Great job!!!!!! you are finished with your 5 1/2 months keepup the knitting !!!!!!!!!!!!!! !Peace Out !!!!!!!!!!!!! Congratulations on finishing your chemotherapy! Wishing you bright yarn colors of sunshine and spring and warmth for your knitting projects. I think Annabelle is working through some serious Writer’s Block in the first photo. Congratulations on being blog-of-note. And, even better, on being finished with chemo! I wish I could send you sunshine from Arizona, and warmer temps to boot. I love seeing your expert knitting: something I aspire to. My very best to you, and I will visit your blog again. Thanks for letting me read your blog. I was wondering if you sell your beautiful socks. I would love to buy a pair! that cat seems to do more blogging than i do! Congrates on getting through chemo. It can be awful, I know from past exp. My father had the big C.I have to agree with the winter thing here in Idaho we’ve got snow too and I’m tired of it.Very nice blog, I will read again. Congrates!Here in PA the weather has been horrible. We just got a storm of snow, ice, and more ice! I can’t wait for summer. By the way Annebelle looks just like my cat Rocky. Have a great day, and I will come back and read again. HelloAnnebelle reminds me of my 2 cats. They do know who is in charge.You have been through alot this past year. Good luck and I hope everything turns out wonderful for you. Have a great weekend. what a little nut, this cat! Its through the battles that we grow …you have a shield and are very blessed to have such a positive outlook on life! Thank you for passing it on to us readers. Will keep you in my prayersP.S. Love your cat pics! The first time I read your blog, I realize that there is always a tough woman somewhere out there that can inspire others (especially women). Congrats for you and I’ll pray for your good life. I am a younger knitter, and I found your blog through blogs of note, quite an honor. It is good to know that your cancer treatment is going well. I was happy to find another blogger who knits and probably loves there cat just as much as I love mine. My cat seems to think that all computers belong to her. She also has many poses with other office supplies like stamps and staplers. What a beautiful and lovable looking cat! 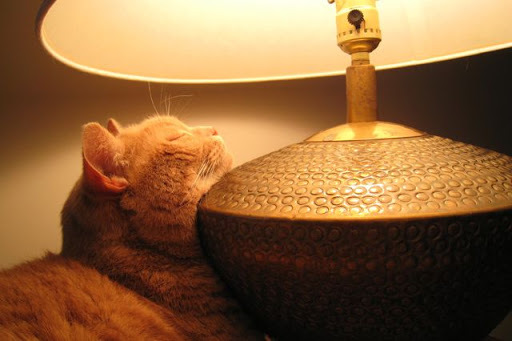 Love the picture of her basking in the light of the lamp- cats always have it in the bag, it seems. Who wouldn’t want to just laze around being so comfortable? Awww…these pictures made me smile. My cat was doing the same, sleeping on my laptop, it think this is a warm place to sleep and they like it.I hope You will be better soon.Greetings from Portugal. Follow meh? !I like your blog.Im 15, and my mother had cancer :[She is having bone marrow surgery this week! Yes, I am a visitor from the “Blogs of Note,” but I’m so glad I found you. I recently learned how to knit, and find your creations beautiful!!! I bought myself a knitting machine for Christmas, because it hurts my wrists to knit for very long by hand, but the darn thing keeps getting stuck and dropping stitches. I don’t know enough yet, how to fix that, so I have a bunch of pieces of partly knitted patterns… LOL What made me want to post here though, is that your cat Annabelle looks just like my cat Killer (she began life as a shop cat to kill the mice, etc.) She is getting older in age and so has been retired to the house, so that she can rest and relax for the rest of her days. She has a funny quirk too. She won’t drink out of a water dish. She will only drink the water that is left in the bottom of the shower, after we’ve used it, or from the faucet of the sink, while we’re brushing our teeth. It’s so funny to watch her do it. Especially since she’s so big, and so old that it takes her considerable effort to jump up onto the bathtub tile, to get to the counter and the sink. You’d think she’ realize that the water bowl is so much easier. I’ll have to come back and see you again soon. Maybe I’ll be inspired to keep knitting even when I mess up. 🙂 Be blessed! I love orange kitties! Annabelle looks like lovable trouble. congratulations on your Noted status. My mom tried to teach me to knit, but it didn’t take. Your work is beautiful. I noticed your blog on the blogs of note page. I realize you have many comments, but this blog of yours made me want to leave just one comment of my own. I love cats and your pictures are adorable. I am thrilled that your chemo is finished. My mom has cancer. She was in remission, but is now in treatment again. I remember the last time, to pass the time, she worked a little on knitting a baby blanket. She desparaged her work, but I hope she finishes it, as you do your beautiful knitting projects. I enjoy your quote by Madeleine L’Engle; I find my truth in writing. God bless you.